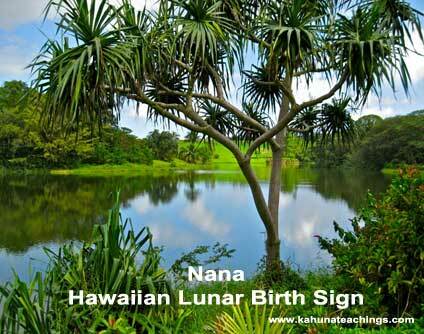 If today is your birthday, according to the Hawaiian lunar calendar, your birth month is Nana and corresponds to the solar calendar month of March. Nana translates in English as “floating” and reflects the buoyant properties of water – the element essential to all life on earth. The month of Nana traditionally signals the ending of ho`oilo, the wet season and announces the approach of spring in Hawai`i. Nana is a highly auspicious month in which to be born. Like the still water that runs deep, Nana natives are traditionally spiritually blessed with papalua (second sight) and special hō`ailona (divination) powers. They are often gifted with talent especially in the realm of na hana no`eau (the performing arts) and enjoy sharing their creative skills with others. Nānā ka maka; ho`olohe ka pepeiao; pa`a ka waha. Observe with the eyes, listen with the ears, shut the mouth. Thus one learns.